Hola, buen dia. me gustaria tener el Master Guide Smith estoy con muchos animos de aportas guias a la comunidad o que puedo hacer para obterner el badge ? Hide 280 comments... Click to show. Hello Moderator,why isn't TERA on double fan coins? I sent you efans a long long long time ago, like months ago. I haven't been very active. When i checked, you still haven't you replyed and given me the fanbucks. When will return the UGC's stock? Hey why are you selling fanbucks on Marketplace? To clear things up, This option is made for people to buy Fanbucks with their PayPal account so they can spend the FanBucks on our items, If a player wants to be sure to have extra FanBucks always, he can buy some and spend them later on. Hope I cleared things up for you! You cant :P , it will show some error ! But gamerz mpgh is technically a place for gamers also, yeah some may cheat but still they game. Hi Norm! I'm writing about a problem with a purchase. Just an hour ago i have bought a 5$ karma coin card to use in CA EU... (Nexon europe have added karma coin as possible payment method) but when i insert the code am error occur: "Card not found or invalid card"... The purchase code is 70098... Please can you check? We have recieved few reports on this matter. We're working on resolving the issue with Karma Koin codes. Until then, please send an e-mail to support@fanup.com and include your FanUp username and the code you received while purchasing from FanUp Marketplace. Thank you. ohh! we will miss you D: Anyway i hope that you will have some great days! New design, small and compact. Hola, ya he enviado el mensaje. Hey Spencer, the rules of the efangelist have been changed, we have adjusted the amount of rewards which you get, and if we go and pick our calculator, we can calculate that we gave you like 21 Fanbucks for each post. This is a lot to be honest. this means that you have earned $20 for like half an hour work. You will not find this anywhere else, and we really do our best to give you as much as we can but we also have our limits which we can give mate. I hope that you will respect this. Thanks! Its been like 2 weeks, when will you check efans?!? I think its very long ive been w8ing longer than you and i post 101. I thinks thats the delay tho. :/ 101 that will take a looooooonnnnnngggggg time. Haha, Are you strugglin with those 101 efangs? well ill let you update and re doo stuff. And look over the iq test. i was for like a 3k fanbucks reward. Norm! I sent a bunch of efans 6 days ago! When will you check them?!?! Hi Norm! Yesterday i have completed 2 penauts lab offers that should give me 760 fanbucks but after 2 days i haven't got the currency yet =( What should i do? Contacting Peanut Labs is always good. But send me a note with the details and I can try to check. Ok! I will send an email with all the details as soon as possible! I'm along the same lines as Spencer funny enough... Attempting to get on the Leaderboard with some custom designed quailty guides.. tbh I just want it to be moderated for next week.. I have read your email about the changes on the efangelist program and rules. I have posted about that on the facebook page =D Cheers! hey why did i only get 1500fanbucks for 21 post but 2000 fanbucks for 20 posts? hey norm, i have a runescapemebership card i really don't need i purchaced a while ago . i didn't use it i quit runescape and im joining mabinogi well if i could get a redund (IF YOU SAY NO IDK i just wanted 40k nx im makein efang) but runescapes boring now but if you can find somone on the site that can buy it for atleast 2000fanbucks or 1700 it will be good. o yeah im sending my new 20 links atm. THANKS!!! Thankx man for the Efan reward, i got a question - do i get 500 extra FB for every 10 efans? Hello sir.. Just want to ask regarding efan. I have email for you. I'm waiting for your response. Thank you.. Norm soon i will write a new and very good review about fanup on a blogger =D I hope you will appreciate mine work. i bought 2000 g1 how i can reiceive the esn? i don't have in my order history and in email NOTHING OF NOTHING! Hey there, send an email to support@fanup.com for all issues related to the marketplace. FYI, PayPal orders are all manually reviewed before the epin is sent to help prevent fraud. I was also wondering can i tell my friends on Alliance of Valiant arms about fanup then take a screenshot? will that count as a efan? Norm you anwsered and said thanks for the efans but you didnt reward me? Give it a few more minutes. Cheers. Ehm..Norm, its been almost 3-4 days and still didnt get the fanbucks. Can you try to check efans today? I want some gcoin before the TEacher workdays are over! Norm, my efans are not accepted, after 1 month i sent them. have you sent them to moderator@fanup.com? Norm I sent you 30 more efans. Hey Norm! I jsut sent like 80 or something more efans maybe 2-3 days ago! Try to check them. Thanks! Thanks for the heads up. Please make sure you email community@fanup.com when you have things like this to report. We will look into it. Ehm I sent like 90 more :P xD sorry for being such a bother. When will you check them? All eFan posts have been checked out and awarded. Thanks everyone! ehm... i have sent an efan. how many fanbucks you will give for each one? Can you please check them soon? I sent them 2 days ago but I need the fanbucks by 1/19 cuz thats the update for a game. Come on Norm! Its almost been 4 days! Hey Norm! Sent you 30 efans! Can you check by 1/15? I need gcoins for Soldier Front update! Its 1/19 update now, but norm its been like 3 days and still no fanbucks. Norm, when will you check efans? I sent 20 like 3-4 days ago or so. I just wanna say...WOW! what a cool site. Hey Norm! I was wondering is there any way to transfer money from fanup to paypal. You should make it one of the choices in the marketplace if it isnt a option! Rank Name	FanCoins 1. Gamerz900	5,700 2. m4rtinest	4,310 3. UsF	4,005 - and i got 500 fanbuckS?????????????? Same problem, I was waiting 10 days for them, but just wait, it'll some within the week (Splooshi will give them at the end or something). Hey Norm! Sent you 20 more efans yesterday! Check them please, Thanks! Hi :D... Why I have not received Fancoins If my guides ("Equip And Exp (1 Acts 54)" "Guide To Warrior corporal") have been approved? Splooshi checks the guides. Give him a shout out. excuse me fanup23 can you tell me for take screenshoots for eFangelist? I like super shot add on for chrome and firefox. HELP! I BOUGHT 200 GCOINS (x2) BUT WHEN I TRY TO ENTER IT ON WEBSITE IT SAYS:This ePIN is not active. Please check to make sure you entered the ePIN correctly HELP!~!!!! send an email to community@fanup.com for epin issues and we will get right on it. They replied and said I would get new pins later, How will i get the code? By email or on fanup? Hi. I hope the Facebook credits can back into stock soon because g coin 200 was out of stock before but now already on stock. Please check it out thanks! Please check out my account. My own profile page "My favorites" when i click on the "PLaying smart" icon/image i was redirected to another user's profile page. Please check it out thanks! There was no problem on my account before. Wait it worked. i posted the code in the wrong place thanks sorry for every thing . hope you get better,if you have a cough and a runny nose try to drink hot stuff with lots of spices it will work :D.
omg.. sorry sir if i can't go to chat yesterday.. i was just slept in the last minute of my post. sorry again.. Norm I sent about 30 posts (efans) to you! When will you check them? I sent them to him like 5 days ago :( still no reply. I've also sent them 5 days ago DX is he on vacation/holidays? Hey, look at this, I REALLY don't trust it, I think it's just plain spamming/fake accounts search up NENO and see: no content, but over 50 "accouts"
Yep, we are aware of the this. Thanks! Also check the weekly leaderboard, the list that is after the 20th, you will see how much people make fake accounts, FanUp should have an IP blocker like if you already made 1 account and the second one with a warning, but not restricted then it should have IP block for making accounts or IP ban. Sup norm , who checks the guides? I made one about ava so when do i get the mysterious gift box code. I sent 30 new efan to you! Merry Christmas i got new efang :) hope you get i sent from my emailasdfghj@llive.ca But i forgot to include my fanup user name should i re send it and put SpencerJ in it? PLEASE i need fanbucks ASAp to give to someone for Christmas!! Verify cmon! Its been 3 days and I still havent gotten my efanagest posts fanbucks?!?!? Gamerz please read the comment below, he doesn't do the guides, Splooshi does! Hi there, Give a shout-out to Splooshi for any questions you have regarding Guides. Cheers! Um are you the moderator? My brother said you are. I sent efanagest posts (20) to you like 2 days ago? When do I get my fanbucks? Sorry about all the questions im kinda new. Cmon dude can you check my posts? Its been 2 days? When will you finish viewing the posts? I just sent 22 posts for 2100 fanbucks to your email! I had to use my email slumbbears1@yahoo.com becuase chucknorristheninja@gmail.com got hacked :( Thanks for your help! Try to reward fanbucks ASAP im poor in AVA. hope you get my email sent to community@fanup.com its about an idea i created and i think 2nd 3rd and 4th in weekly leader board are spamming too. first place is doing good :). Hey! Can you please check asdasd000000's IP addreses of his "fans" I don't trust it, he got 2k FanCoins with just 2 guides? He has no fans that are unknown for me and active, on his page no-one thanked(or something) him for inviting/referring to FanUp, and also if he doesn't make fake accounts (what I am insulting him for in a short way xD) he also spams! True! Also that inskilled999 is a spammer, please warn him with a REAL warning, unlike the normal users' warnings! sorry i havent sent it yet error.. Thanks for the tips everyone. There are always Guardians on the site, you just might not see them or we might be fighting spammers in other places on the site. We rely on your tips to keep this site the best around! OMG! Pls suspend Jesuisqui account he spam like a noob! and i can't post anything because he spam too many! Where are all guardians, there's alot spamming and I never see the following guardians : EliteCrime -AustinBlans -Jamesmorey and FanUpProSon is this just me or are these guardians never online anymore ? hi there , can you watch my latest guides before the new week of efanglist will start :) thanks. And also, when I get on fanup.com its says: Welcome CNTN! but im not even logged in? that is just in the cache. You actually are not logged in. Hey, in the chat room you said you would check my posts and give me 2000 fanbucks but I still havent recieved them? Also get mine you know my email :D Ctrl + F to find my posts, I got 2-3 emails! I NEED GCOINNNNN! When will I get my 2000 fanbucks? And im pretty sure that people are spamming for fancoins like Raytiger3 said. Oh Norm has been active. I just taught him the way of the stealthy ninja. Norm, thanks for your attention and i want help on the free fanbucks offers. I cannot do most of them as i see nothing after i clicked on the job i want to do. Please help me check out my account please, thanks. Hi norm!! Sent 20 fanup posts to you! Took me two days. Can you add the fanbucks? Thanks! That's OK! I like friendly!!! He spams a little much... like 3,4 greets in 1 page? but but but... i just got 500 fanbuck (saying weekly 3rd prize)- might be from last weeks conflict ?or is it from this week? I sent 10 efangelist posts 2 days ago, still no fanbucks? I send 20-30 eFans... still no reply! NO submit button...... still not fixed. Please send a note to support@fanup.com with all the details. bro; Did you received the mail of advertisements? yo i dont mean to spam your profile but you can delete these later i just sent a new email to community@fanup.com about my new links the ones i just got the fanbucks for so just delete it im super super sorry for making a problem :( FANUP FTW EVERY BODYS WITH ME!!!! thanks to ever fanup moderator!!!! including you the most~!! Hey, check out your Twitter inbox! there's no feedback...pls help me,i need my 200gcoins now,i ordered first the 200 then 100,why is 100 arrived and 200 no?it must be 200 first then the 100..
i recieved 1 ESN code,but i need the other 1 for 200 gcoin,when will it arrive? 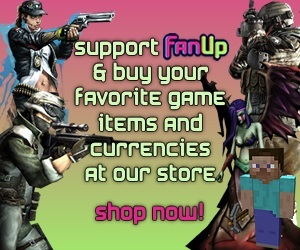 Please send a note to support@fanup.com for all purchase questions. Thanks! its been 18 hours since i ordered my gcoin,until now i cant see the ESN,IS IT NORMAL? Congratz to FanUp!! Our event is being shown officially on the ijji forums by a GM! Congratulations :D! hey bro, i sent you an e-mail :). Greetings! Norm can you approve my efanges? Thanks again. Hey Norm. Could you answer the most recent question I posted on the FanUp Community Page? Thanks :). Can you approve my efanges? :D Thanks! Splooshi approves the guides. Cheers! Are you referring to your FaceBook posts? Sure! Those are good posts, just in kind of an empty Facebook acct. Put those in an active place like a gaming forum, blog, legit searchable Yahoo Answer etc. and you are good to go. Just send me a link and screenshot. Cheers to moderator@fanup.com. Btw I did credit your acct w FanCoins for your facebook already earlier this week. I just can't keep doing that. Hi Everyone, It's best to to send issues with the sponsor surveys and offers to community@fanup.com. Thanks! check your email i sent a email about the survey not giving out my fanbucks. I don't see it!?! Bummer. If anyone has any questions about orders, please send a note to community@fanup.com. Cheers! Its a FanUp intro made by Rochelle. Judging from your avatars background, I see you made it to the Bahamas! Great...300 FanCoins x 2 for Double days! Hey its a little to red,you can hardly read the writing,tone it down a little,because its kinds disturbing. I would also have to agree. It does seem a bit to dark thus making the font of the content seem non existent. However, I'm extremely excited that this feature is being developed as Iv been wanting it in for quite some time :D! When will the eFangelist winners be announced? And also, check the moderator@fanup.com e-mail please. Thanks!! <3. Hey thanks for the fan! for the last few days and they are out of stock when will the be in?? I've sent a note to support@fanup.com. That is the best place for these kinds of issues. Cheers. I didn't get anything new, and I still can't wear my T-Shirt. K. I will look into it. Order issues are best sent to support@fanup.com. Thanks! I did that, no reply still for 4 days. And I'm sure I sent it correctly, =/. Could you do something? Check the support@fanup.com e-mail plox :D.
yah that guy just wouldn't stop,cant you like mute him for a couple of days instead of banning? Just dropped you a line bro, check your email. Do you have any suggestions for my problem,maybe because my windows seven is 64 bit? man..please.BANN OKIDOKI98 HE'S SPAMMING LIKE HELL ON MY PROFILE.. THANK YOU MAN TY FOR EVERY THING LIKE FAN BUCKS!!!! so are there new premilinary tasks yet? yes i'd love to still be a mod lol. Would be nice to get more privleges as a moderator. is there any other premilinary task for becoming a mod? Your guides are pretty small, datest, to be worth 500FC each. datest, its up to 500 points. Doesnt mean you will get 500 for each. 500 fancoins for each guide, I have made 6 guides. Do the math. 3,000 Coins for guides? That's CRAZY! I haven't recieved my 3k fancoins yet for my guides. Please do check! well, I turned most of my quickie guides into tips but it doesn't show in the tips section. They're also not found in the guides anymore. I think I my quickie guides are gone. There seems to be a problem. Whenever I try to change one of my strategy guides into tips, it doesn't move onto the tips section. Any idea? Oh, nevermid. I think I got it. I changed the shorter guides into tips. Sorry about that. The next time I make a strategy guide, I'll be sure to make it more detailed. Is there a way to change it into a tip? The avatars look nice :) Looking forward to that. Yowza, where do I get some o dat?